1880 Born in Boston, raised in Worcester, Massachusetts. 1902 Graduated from Mt. Holyoke College. 1904 Taught school in Lake Forest, Illinois and worked at Hull House and Chicago Union in Chicago. 1907 General secretary of Philadelphia Research and Protective Association; studied at Wharton School of the University of Pennsylvania. 1909 Moved to New York with fellowship to Columbia University. Research and field work on child malnutrition in Hell’s Kitchen neighborhood became basis for master’s thesis; spoke on soap boxes and at rallies for women’s suffrage. 1910 Master’s degree from Columbia University; hired by New York Consumers League. 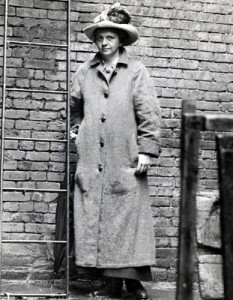 1911 Eyewitness to Triangle Shirtwaist Factory Fire. 1912-1915 Hired by Committee on Safety of the City of New York, citizens’ group created in response to fire; expert witness and primary investigator for state Factory Investigating Commission which led to the enactment of some of the first workplace health and safety laws in nation. 1913 Married Paul C. Wilson (b. 1876 – d. 1952). 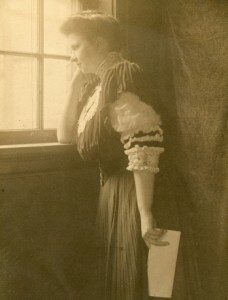 1916 Daughter Susanna born (b. 1916 – d. 2003). 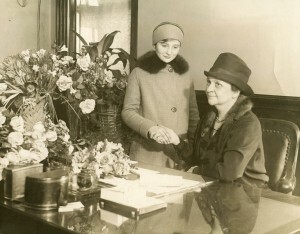 1918 First executive secretary of Maternity Center Association. 1919 Appointed a member of the New York State Industrial Commission by Governor Al Smith. 1921 Appointed executive secretary of the Council on Immigrant Education. 1922 Appointed a commissioner of the New York State Industrial Board; became its chairman in 1926. 1929 Appointed New York State Industrial Commissioner by Governor Franklin D. Roosevelt. 1933 Appointed U.S. Secretary of Labor by President Franklin D. Roosevelt, first woman U.S. cabinet member. 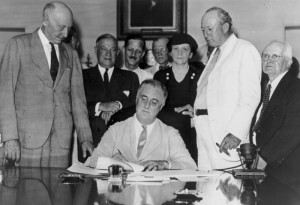 1933-1945 Major accomplishments of her 12-year tenure as Secretary of Labor included: Social Security Act. Directed the development and passage of landmark law establishing old age pensions, unemployment insurance, survivor benefits). CCC, NRA, PWA, WPA. Instrumental in creating major New Deal jobs programs. U.S. Employment Service. Created by Wagner-Peyser Act. Fair Labor Standards Act. Maximum hours and minimum wages in all interstate industries; restrictions on child labor. Bureau of Labor Standards. Industrial accident and occupational disease prevention; working condition improvements through research and union/employers conferences. National Labor Relations Act. Right of workers to organize, collective bargaining. International Labor Organization. Coordinated effort for U.S. membership.Immigration. Saved thousands of refugees by limiting deportations to Nazi Germany. 1945-1952 Appointed to U.S. Civil Service Commission by President Harry S. Truman. 1955-1965 Visiting professor at Cornell University’s School of Industrial and Labor Relations. 1965 Died in New York City, buried in Newcastle, Maine.